I was digging through my collection 2 weekends ago and found these guys. 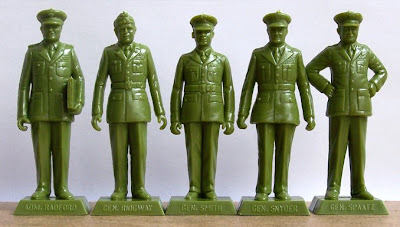 This set of Marx WWII 5 star generals was originally released sometime before 1954. 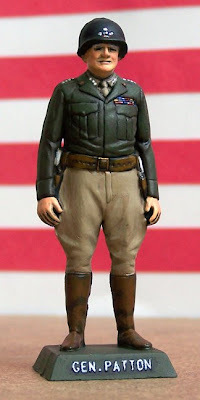 My collection doesn't include Eisenhower's miniature, but I know one existed. These models are reproductions, cast from the original molds. I purchased the set 10 years ago from the Toy Soldier Company, back when they had a printed catalog. They don't seem to be on their current website catalog. Marx Toys was an immensely popular company supplying 1/32 scale plastic play sets to the youth of the 1950s and 60s. Toy tycoon owner, Louis Marx, was a good friend of Dwight Eisenhower, and was an all around patriotic American. 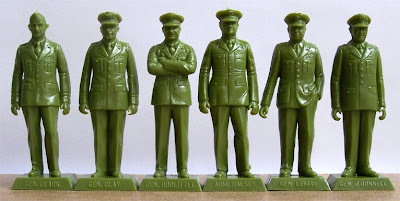 His typical play sets featured excellently sculpted army men from the Revolutionary War, Civil War, and WWII. There was a caveman set, animals, a circus, astronauts, townspeople, etc. This set of generals, a similar set of US Presidents (and a set of dancing girls!) seem to have been made for his own amusement and interest, rather than profit. The men stand around 60mm tall from the bottom of their fee to the tops of their heads.